Nulaxy BR18 Bluetooth Transmitter and Receiver is an innovative product that will bring more comfort to your life.Who has never had problems with cables? We want to solve this problem and make your life more practical and functional. Imagine being able to play and listen your favorite music wherever you want. Listen the audio of your movie on your favorite headset. Listen that important game on your audio system. With Nulaxy BR18 bluetooth audio receiver, everything is possible! 2-in-1 Wireless Receiver / Transmitter will add and transmit what you need and wherever you want. The largest battery in the market of 1050MA can be recharged in power bank, usb output pc / laptop / tv, power outlet. Have a wide range of signal you will not have problems of connection or interference, we guarantee a stable and secure connection in transmission and reception. BR18 has a 60-day free replacement warranty and after 30 days of purchase, you can register an extra 18-month free warranty on the official Nulaxy website. What are you waiting for? Add in your Cart the Nulaxy BR18 Bluetooth Transmitter for TV right now and get rid of the cables and add Bluetooth to your devices. 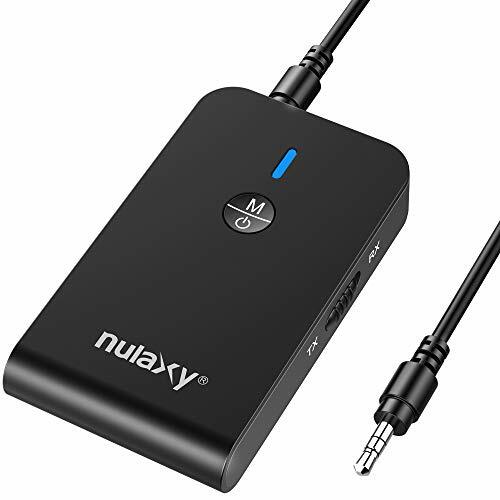 √ BLUETOOTH IN EVERYTHING: Nulaxy BR18 bluetooth aux adapter will make your device receive and transmit through the Bluetooth connection. Which device do you need to receive or transmit Bluetooth? TV? Speaker? Sound System? BR18 has come to solve your problem. √ THE BIGGEST BATTERY: The battery with capacity of 1050MA allows you to transmit for 38 hours and receive for 30 hours. Competitors' battery with 250MA allowing 10 hours of transmission and 8 hours of reception. Battery is everything and Nulaxy BR18 car stereo speakers delivers you the biggest and best in the market. √ IT GOES FAR AWAY: With long range you'll be able to use your Nulaxy BR18 bluetooth receiver and transmitter up to 15 meters. We know that long reach is necessary for good experience. With AptX Low Latency, you can watch video while listening to wireless audio in a synchronized fashion and without any noticeable audio delay. √ CONNECT EVERYTHING: In the transmission mode (TX mode) you can connect two speakers or headphones to this bluetooth adapter and play music on both at the same time; In the receiving mode (RX mode) you can connect two smart phones at the same time. √ WIDE COMPATIBILITY: Both modes of transmission and reception are compatible with most devices on the market. Nulaxy car bluetooth has 2 types of connection through cables (3.5mm audio cable and 3.5mm female to 2 RCA male cable) and through Bluetooth, compatibility will not be a problem for our home stereo system.